In this trek, which is not so difficult compared to Annapurna Circuit or Everest Trek, you can experience the non-touristic side of Nepal. In the first 5 days you will walk in a secluded area, which path is not known by many tourists, so you can enjoy the nature apart fom the hustle and bustle of the well-known trekking trails. You will get the chance to become part of the village society by having dinner with them and spend few nights in the houses of host families there (Bas Kharka and Tikot). This trek is especially great in February, March and April, because during this time the rhododendron bloom and in the villages there are many many oranges hanging in the trees. If you want you can pluck them and eat while walking. During your trek you will get great views of Dhaulagiri, Annapurna Range and many other mountains. With reaching Tatopani you are back on the well-known trekking trail of Annapurna Circuit and will see more tourists on the way now. You will walk till Muktinath, famous for its Monestries and then go back to Jomsom and fly back to Pokhara with great views of the mountains during your flight. Spend the last days comfortable in Pokhara and Kathmandu, go sightseeing and shopping and recover from you long trekking tour. Namaste Nepal - Upon arrival at Tribhuvan International airport our representative welcomes you and transfers you to your hotel in Bhaktapur. After time to get refreshed the trek leader will meet the group and give you a detailed briefing on the trek, so that you are well prepared for the trip and any last-minute question will be answered. After having breakfast you will go for Sightseeing in Bhaktapur which is located in the east corner of the Kathmandu Valley. It is an ancient Newar city abought 8 miles far from the capital city Kathmandu. Bhaktapur was the largest of the three Newa kingdoms of the Kathmandu Valley, and the capital of Nepal during the great "Malla" Kingdom until the second half of the 15th century. It is famous for its rich culture, temples, and wood, metal and stone artworks. Because of this it is also listed as a World Heritage Site by UNESCO. Drive from Kathmandu to Pokhara. It takes about 7 hours by tourist bus. Looking out of the window of the bus you get beautiful views of mountains, the rice terraces which are so typical for Nepal and the people working on the field. After reaching Pokhara, you will be escorted to the hotel. Pokhara is one famous tourism area of Nepal because of its location at Phewa Lake and the stunning view of the Himalaya. Take rest and enjoy the magnificent views of Dhaulagiri, Manaslu, fishtail (Machhapuchhare) and five peaks of Annapurna. After having breakfast you will drive in our privat car to Beni. From here starts your trekking! Your trek will start easily by walking along the Kali Ghandaki River. Then you have to climb up the steep path to Bas Kharka (1525 m), On the way you see many rice fields and aged villages. When you arrive you will be welcomed by the locals with a traditional nepali tea and in the evening you get the chance to sit together with the family and eat dinner. The everyday life of the people begins very early. After breakfast you will leave the village and trek through rhododendron forest with great views of the Himalayas up to Danda Kaske, where you will eat lunch. Very few tourists find the way to this village and the children are curious to get to know you. Then you will hike further to Nangi. After your Aarrival and time to refresh you will explore the village, visit the school and see where they produce paper. 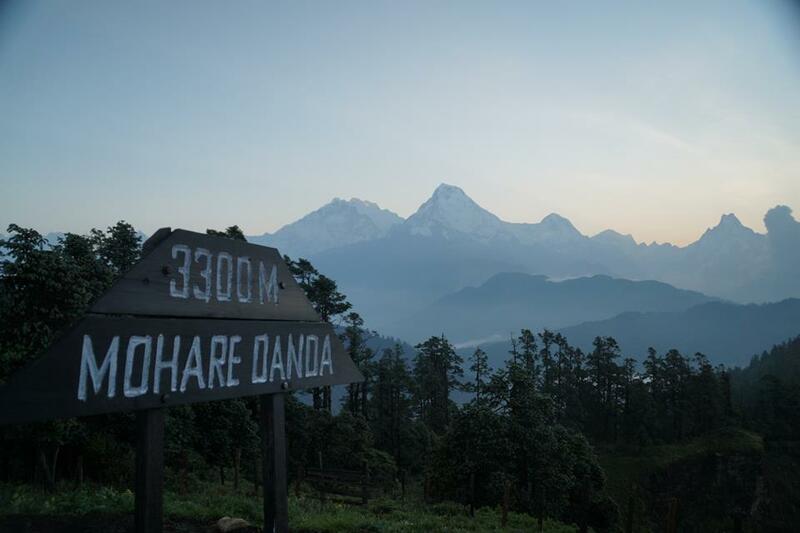 We advise you to get up early today to enjoy stunning views of Dhaulagiri during sunrise. Today will be the most difficult day of your Trekking, because you have to climb about 1000 meters up to Mohare Hill. You will go bistarai, bistarai (slowly, slowly) through the rhododendron forest until you reach Mohare Hill with its fantastic location. You will be rewarded for the effort of the last hours with excellent views of the huge mountains of the Annapurna Region. Today you should again wake up early, before the sun rises. The sunrise you can see from here is unique. After taking a lot of pictures you will trek downhill to Danda Kharka. In this area you can find a variety of different birds, which feel good in this region with lots of rhododendron. From there we will go further to one of the most charming locations of your trip, the village Tikot. The medieval houses with their slate roofs are standing close to each other. Chicken, goats, and cows live harmonic next to each other. Explore the village and watch the daily life of the locals, who live mainly from agriculture. You will follow the river to Tatopani. After your Arrival there you can relax in the hot springs near the village. Today you will follow the way to Marpha. Today you will mostly walk on a bigger road, not on a path like before. Today you will follow the way to Marpha. Actually Marpha is a Thakali-Village, but because of the big monestary many tibetan people came and settled there. In the surroundings and also in the village you can find a huge number of apple plantations. If you want you can buy the local brandy in one of the souvenir shops which is produced of the apples there. But be careful - it is really strong! From Marpha you will go through a valley to a bigger village called Jomsom. It is the centre of this region with agencies, hotels, banks and many shops. There is also a domestic airport. From there we will go to Kagbeni, a village with rich culture and very hospitable people. Today we have to climb a steep path up to Muktinath with a height of 3750 meters above sea level. It is a famous place for pilgrims, for buddhists as well for Hindus. This locality is a religious and holy place for the believers. But you can find many shops and hotels there as well. Today you will enjoy the last day of your trek. After arrival in Jomsom you have time to relax or buy some souvenirs in the shops. Early in the morning we will fly back to Pokhara. Again you can relax at Phewa Lake or go shopping at the Lake Side. If you want you can also make a boatstrip or climb up to World Peace Pagoda from where you will have again a great view of the Himalaya. After arrival in Kathmandu, you will have free time. If you want you can stay in the hotel, relax and recover from the long trek or you can go to Thamel for shopping, visit Kathmandu Durbar Square, Pathan Durbar Square or whatever you like. Today you will visit the most important sightseeing locations of Kathmandu. First Swayambunath, the "Monkey Temple" in Kathmandu, a buddhist pilgrimage place for buddhist with a small Stupa. Then you will drive further to Pashupatinath. It is an important pilgrimage place for Hindus and a lot believers from India come there every week. There are lots of temples and at the shore of the holy Bagmati River, the believers burn there dead relatives. Then you will go to the big stupa of Boudhanath, which is also known as little Tibet and enjoy your dinner at the rooftop of the hotel with view of the stupa. You will be transferred to the airport and fly back to your homecountry. - Personal expenditure: e.g. drinks, souveniers, laundry, snacks, etc. Experience the Annapurna Region in a non-touristic way during the first 5 days of your trek. Then join the well-known trekking trail of Annapurna Circuit and visit the beautiful village Muktinath. Become part of the village society by having dinner with them and spend few nights in the houses of host families there (Bas Kharka and Tikot). Enjoy amazing views of the Himalaya, for example Dhaulagiri and Annapurna Range, explore the Durbar Square in Bhaktapur and visit the most famous places during Sightseeing in Kathmandu.